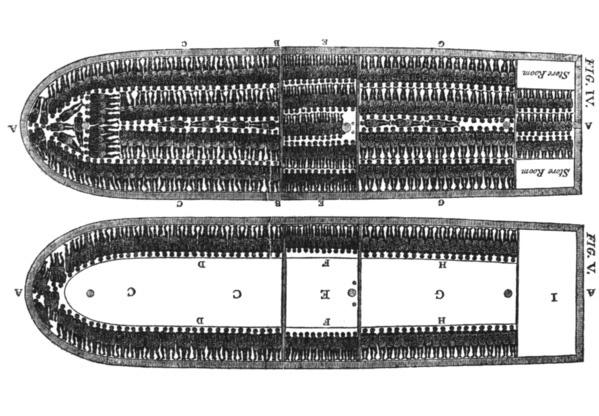 Diagram of a slave ship from the Atlantic slave trade, ca. 1790-91, courtesy of Lilly Library of Rare Books and Manuscripts, Indiana University. The conditions for enslaved Africans crossing the Atlantic Ocean in the Middle Passage were brutal and deadly. “Slaver” ships were specifically designed for maximizing the numbers of African men, women, and children that slave-trading captains and their crews could bring to the Americas. Once on board, crewmembers segregated enslaved Africans by gender and then chained and packed them closely together in ship holds. Captives then endured up to several months of extreme temperatures, harsh weather, filthy living conditions, and contagious diseases in these ship holds as they crossed the Atlantic Ocean. Roughly twenty-six percent of Africans who endured the Middle Passage were classified as children; captains chained men for the longest periods to prevent rebellion; and enslaved women often suffered sexual assault from crewmembers. The conditions on slaver ships were so harsh and unbearable that from thirteen to nineteen percent of Africans died in the Middle Passage. Mortality rates were particularly high during the first few centuries of the trans-Atlantic trade, before shipping technology improved to shorten the length of the overall voyage. Though the ocean passage may only last a few weeks, the overall Middle Passage often took months because European slave captains lengthened the voyage by making stops in various African ports to seek more slaves to fill their ship hold. They also made numerous stops in American ports to attempt to sell their enslaved cargo at the best prices. Different points of disembarkation and arrival also influenced the arduous ship conditions for enslaved Africans. While the few voyages sailing from Upper Guinea could make a passage to the Americas in three weeks, the average duration from all regions of Africa was just over two months. The conditions that millions of Africans endured during the Middle Passage into Amerian slavery stands as one of the greatest examples in history of human beings inflicting dehumanizing suffering on fellow human beings. As British abolitionist William Wilberforce (1759-1833) stated, “Never can so much misery be found condensed in so small a place as in a slave ship during the Middle Passage.” In the holds of slave ships crossing the Atlantic Ocean, millions of enslaved Africans first experienced what it meant to be defined and treated as chattel property in the context of New World slavery. 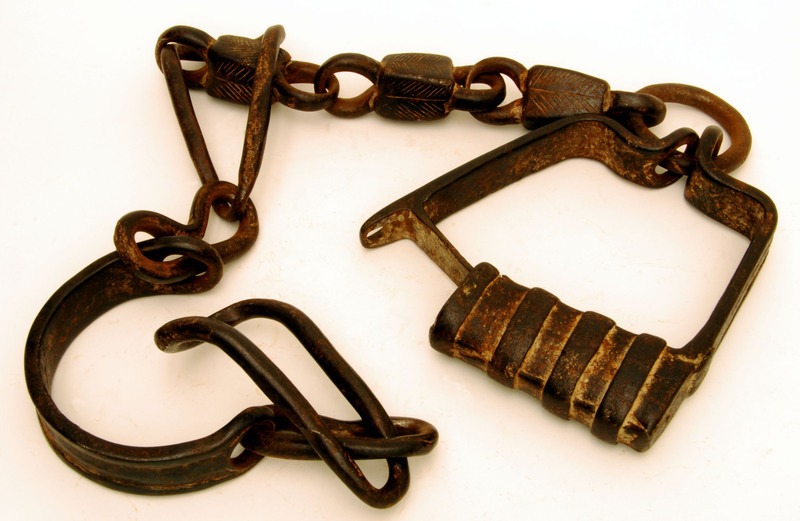 Set of iron leg shackles used in the trans-Atlantic slave trade from Africa to North America, 18th century, courtesy of the Avery Research Center for African American History and Culture.